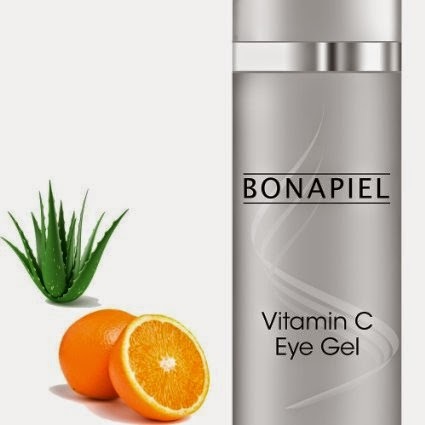 Bonapiel's Vitamin C Eye Gel is a lightweight non-greasy Vitamin C gel that aids in the renewal and cellular reconstruction of the undereye area. It contains Vitamin C, cucumber, aloe vera, and green tea. These ingredients work together to improve firmness and hydration, reduce the appearance of crow's feet and aging, and provide anti-inflammatory effects to reduce puffiness. The green tea also provides protection from environmental damage. I love the feel and texture of this eye gel. Since it is lightweight, it doesn't feel all goopy or heavy, but slides on easily and rubs in smoothly. My favorite feature is that it can be used all around the eye, including eyelid and brown bone, without any irritation to eyes. I love an eye gel that works the entire area - because afterall, your eyelid is thin and delicate too, and deserves proper care. This can be used in the morning under makeup, and at night before bed. I prefer using it mainly at night. My eyes look more awake the next morning, and feel soft and hydrated. The gel also doesn't leave behind any residue so I don't have any flakes or goop when I wake up. It's very soothing and has helped improve the look and feel of the skin around my eyes. Highly recommended.